Our Beautiful home is located among the finest hotels in Poipu at a fraction of the cost. This home has 3 bedrooms, 2 bathroom in a split level design. Koa wood design floors throughout the living areas add warmth and a cozy feel. New kitchen and bathroom cabinets. This home is located on the southern most point of Kauai. This makes viewing the whales most exciting. They come around the point so close you can hear them! Walk 5 minutes to enjoy the Grand Hyatt Resort and Spa. There is a championship golf course next to the Hyatt. Walk the opposite way from the Hyatt and enjoy some of Kauai's finest snorkeling beaches. Poipu Beach Park is right down the street! This home is centrally located and only 20 minutes from the airport. Poipu's shopping areas and wonderful restaurants are only 5 minute drive. We live in California but have grown to love Kauai. We bring the family there at least 2 times a year. We had first loved the north Shore and almost purchased a house there. Then this house came available thru a friend. We were so happy that we picked Poipu. The weather is sunnier and there is many things to do. We love to go to the west side to surf. The beaches at Polihale are wonderful and secluded. The beach within walking distance is wonderful for families with small children. Poipu Beach Park is called Worlds Safest Beach! Hang out at the Grand Hyatt Spa for the day of classes and treatments. They have a day pass available to visitors. Master bedroom tho it does not have an ocean view, it faces Black Mountain which is a beautiful ridge line in Kauai. 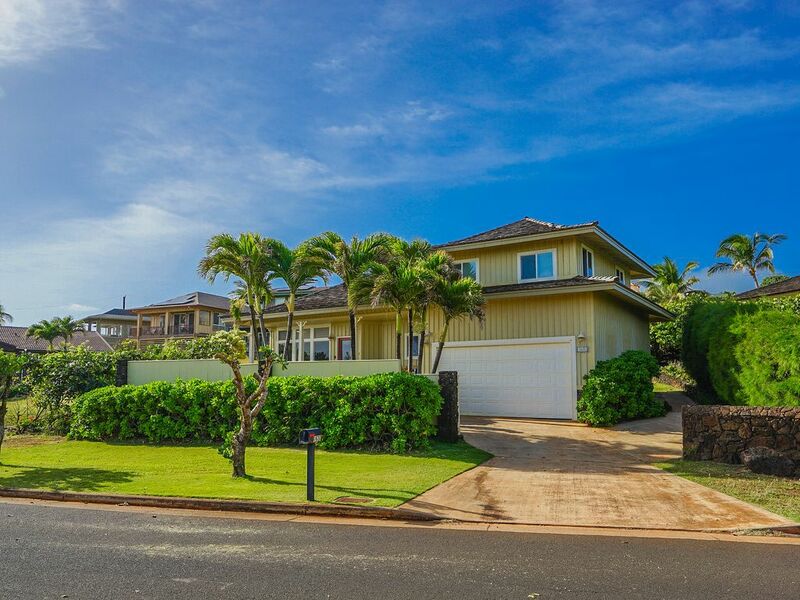 Facing Kauai's southern most tip, our house is situated so that most rooms have an ocean view. Both bedrooms upstairs as well as the living room and kitchen look over Kauai's blue waters. Another wonderful perk of this location is to watch the migration of the whales that come so close to the southern tip, that you can hear them whistle and call to each other. Stackable but large capacity washer and dryer located on main floor. Plenty of parking in driveway as well as on the grass in front of house. Beach towels located in closet downstairs. We have one. That is a good thing! Yes, we have an oven and stove too. Limited pantry items such as spices and oils. Light and bright kitchen with lovely Koa wood cabinets. Watch the ocean as you cook! Nice area off of the kitchen to eat the wonderful hawaiian meal that you prepared after a long sunny day on the beach! Take some/ give some. There are books in the closets. Some popular movies to view on the DVD player. Beautiful manicured garden including large lawn area to play. Great open house with water views. Great open house with water views. Everything was as stated in the listing and owners were very easy to deal with and responded in a timely manner to all enquires. This place was so conveniently located we many times walked to many of our beach activities and even some hikes. The house was clean and had plenty of food prep items. The house was also arranged well with the master on one side and two bedrooms on the other. It made the home feel much larger than the actual square feet. It had nice beach chairs, umbrella, and a brand new boogie board. It was the perfect size home for us and our three kids. Thanks so much for sharing your great home with us! Loved our time in Poipu! Great time at this Poipu Beach house. Had all the things we needed, including beach chairs, umbrella and coolers. We left behind a boogie board for future guests. Would definitely recommend this house. Looking forward to our next trip to Kauai!! Perfect for family of 6. Easy walk to beaches. Short drive to shopping and restaurants. Very nicely furnished and well equipped with everything you'll need for cooking in or beaching out. We enjoyed our stay at this property! The prior reviews were spot on. We were there for five days in January and two of the five days were pretty uncomfrotable due to the heat. This property is not suitable for young children due to the amount of stairs/steps. However, if given a chance to return with adults or older children only, we would rent this property again without any reservations whatsoever. The temperature in this home each evening was quite comfortable and it was very clean. My only suggestion would be to include a set of steak knives as the grill is very nice. The view is spectacular and the neighborhood is very quiet. We watched whales each morning from the front porch area. There is a pack and play, beach umbrellas, chairs, toys....that came in very handy. Thank you Wendy for sharing your wonderful home. We plan to rent this property again next year. Since we are located a 5 minute walk from the Grand Hyatt, it is fun to book a treatment in their world renowned spa. You can use their facilities all day when you do! Check in time is 4:00 PM Check OUT is 10:00 a.m.